After graduating RIT in 1953, Neil Montanus began his dream job at Kodak. 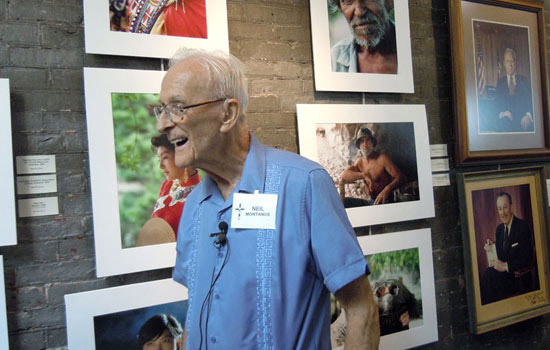 His 35-year career included 55 Coloramas, innovative underwater photography and portraits. An exhibit of his work was displayed at the High Falls Gallery in Rochester earlier this year, pictured here. The photographs taken by Neil Montanus ’53 have been displayed in New York City’s Grand Central Station, the White House and Walt Disney parks, to name just a few locations. Now, his work will be featured at the place where it all began for Montanus—Rochester Institute of Technology. Montanus, who served in the armed forces during World War II but did not see combat overseas, enrolled at RIT to study portraiture and photo illustration. His studies would be interrupted, however, by the outbreak of the Korean War, which brought him back to the military to train infantry at Fort Riley, Kan. After the war, he was able to return to RIT and pick up his coursework right where he left off. He graduated in 1953 and returned to his hometown of Ashton, Ill., near Chicago, where he secured a job with a photo studio. A year later, Montanus received a job offer from Eastman Kodak Co. to work in its photo illustration division as a portrait photographer. He moved back to Rochester for the job that would prove to be the starting point of an illustrious career with Kodak. Among the wide variety of assignments he received was the task of taking the official photos of Kodak’s presidents, CEOs and board members. However, the portraits that he is most proud of taking were of even more famous business leaders and presidents, specifically, Walt Disney, whose picture is still used by The Walt Disney Co. in many of their facilities, and Gerald Ford, whose portrait was used as the official White House photo of the former president. During his career with Kodak, Montanus had the opportunity to shoot a lot more than just portraits. He took 55 of the 565 Colorama photos—Kodak’s colossal, panoramic promotional displays that dazzled commuters in New York City’s Grand Central Station from 1950 until 1990. He also snapped photos promoting numerous products for Kodak’s advertising campaigns. Both the advertisements and Montanus himself have travelled the world, spreading the appeal of photography—he has been to more than 30 countries on six continents to take pictures. After a 35-year career, during what he describes as the “golden years” of Kodak, Montanus retired, at age 62. He wasn’t quite finished, however, and a short while later, Kodak brought him out of retirement to serve as an ambassador for the company by training groups of young photographers. Training others was a skill that he had picked up years earlier when he was hired to teach night classes in photography at RIT, while working for Kodak. His photographic achievements haven’t ended either. One day, when going through old Kodachrome slides in his basement that he thought had been destroyed by moisture, he made a discovery that has become his latest project. His photos on the slides had been transformed by the bacteria into abstract, vibrant displays of colors and designs. The bacteriographs were born. University Gallery is located adjacent to RIT’s Vignelli Center for Design Studies—home to the entire archive of graphic and product designs by renowned international designers Massimo and Lella Vignelli. Gallery hours are from 9 a.m. to 5 p.m. Monday through Thursday and 10 a.m. to 2 p.m. Friday and Saturday. The gallery is open in correlation with the RIT Academic Calendar, and will be closed from Dec. 22 to Jan. 6. For more information, contact the gallery manager, Jessica Erickson, at 585-475-2404 or jleugs@rit.edu. University Gallery is hosting an exhibition of Neil Montanus’s work from Nov. 28 to Feb. 22. 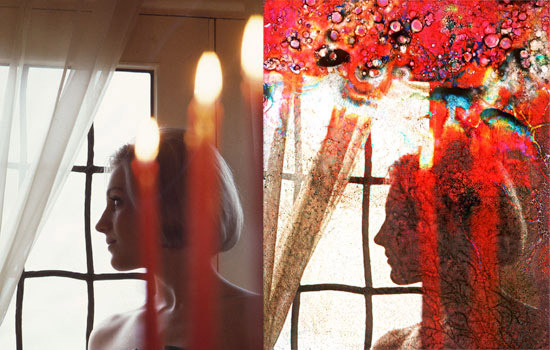 Among the works displayed are Montanus’s “bacteriographs.” One of Montanus’s photographs, before (left) and after (right) being transformed by bacteria.